Following several days of heavy rain and snow melt, Southwestern Indiana is now seeing the result as waterways continue to rise, spill out of their banks and onto roadways. The Indiana Department of transportation urges motorists to avoid these areas. According to the National Weather service many areas of the White River will be cresting either today or tomorrow while the Ohio River at Tell City is expected to rise to about 44 feet by the end of the week (flood stage is 38 feet). This constitutes “moderate flooding” on both waterways, though the White River is seeing its highest levels since March 2017. If you see water over the road, do not drive through it, but report it to the TSCC or local law enforcement. 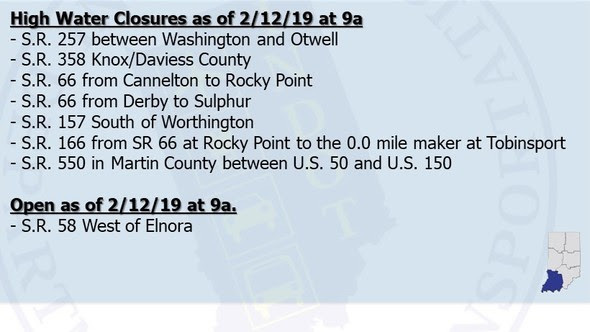 Motorists can use the INDOT App for Apple and Android devices to see the latest information on road closures due to flooding. This map can also be accessed via laptop or desktop at INDOT.carsprogram.org.